hello all members of truelol server(respectful all stakeholders).as you might know(or may not know), i was last night banned(account suspension) for, i do not know how long(nor i care anymore).so i ve take a decision to rather not defend myself, but to once again point out why power should not be given to people who cannot use it to make good. secton1 rule7: 7. 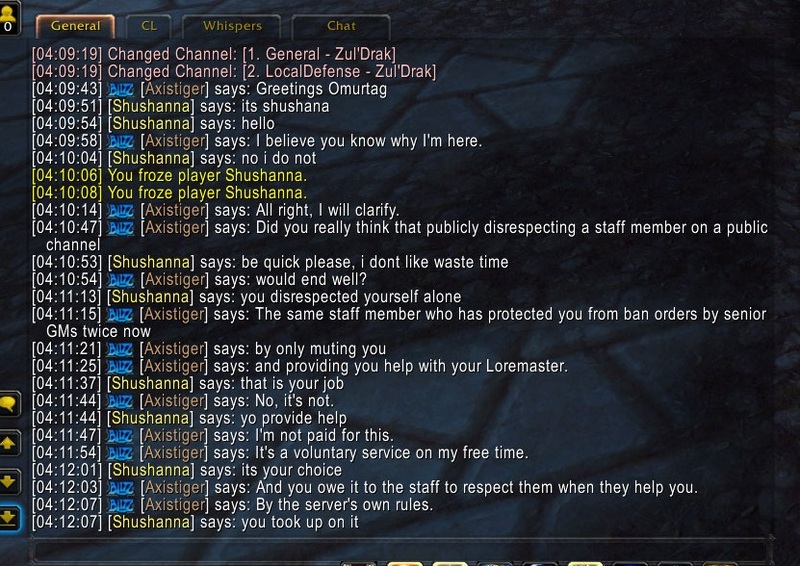 Abusing the ticket system to spam or disrespect TrueWoW staff may result in a temporary suspension. section2 rule 9: 9. Link, advertise or discuss other media and websites and/or discussion of content of an inappropriate nature. This includes but is not limited to: racist material, other private server, the trading of real life possession and content of a sexual nature. 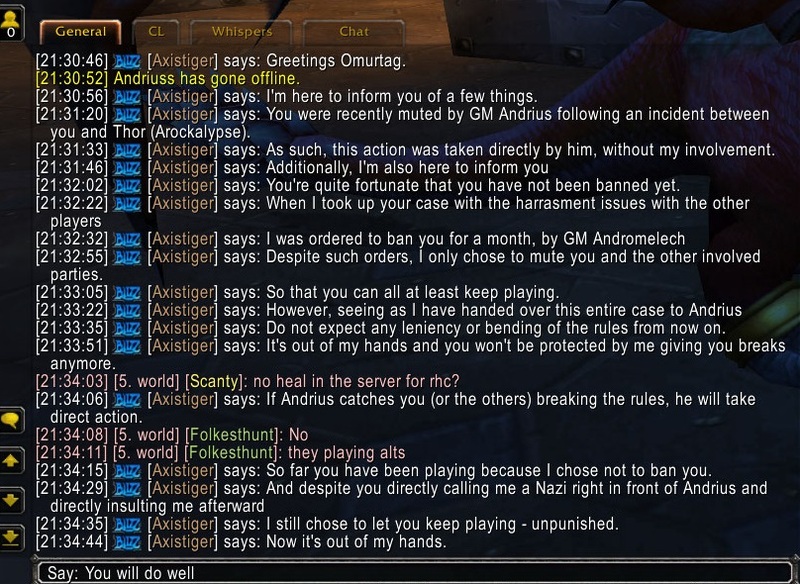 in regards of section one rule7: how is an offence if i have had pointed out that the mentioned GM's name Axistiget is tightly connected to nazi germany?its the complete true, if the name isnt enough pfroof-look at the persons profile picture here at truewow:its a nazi cross, no second opinion about it. section1 rule 9:how did i ever discussed a content of inapropriate nature?i was not racist in anyway whatsoever, nor i was political, in any direct way.there was no agitation, nor there was instigation.mind, that if i have ever said anything, it was in defence of the peaceful exitence of the HUMAN race!Unlike the gamemaster Axistiger, who very much so contradict itself, by issuing a ban on me for something that same GM shout ban itself!! in addition, i was never told about duratiuon of that ban either. Sufficint to mention that particular GM is well biased against me:reasons-GM is very friendly with 2 or more persons who dislike me. lastly, i am adding a number of links with my last conversation with GM Axistiger. to all who expressing support reading this:you are on the right way, friends! to all my friends who want to further keep contact and communicate with me, please write me here inbox your email, skype ect. to management: you really need a sharp U turn in your recruitment methodology, rules&regulations, and overal webpage, server client and connections with the public/advertisement in order to if not achieve population growth, at least to maintain this one. to all the haters: at the end love always wins! and to clarify:i have not done wrong, not by server rules nor by any general common sense in regards of any european state law.there was no lies spoken nor i falsely pointed out axistiger can be associated with ww2 axis regime or the cross at its profile here isnt a nazi cross-it is!and that was not a public disrespect, that is the truth, and changes must be made in the right direction! thank you for reading all the support, and god bless! As always Omurtagg your points are all moot and your proof is useless, your are a destabilising factor.... I was suggesting that you should be banned for 2 weeks at least back when you started throwing a cussing and insults temper tantrum with those other 2 guys on world. Now since you are insisting with this utter crap I am upgrading your punishment, the ban will become permanent and your forum account will be suspended. Enjoy the rest of your holiday from our services. sir, you cannot even argument yourself.not me but your words are empty and without a cover.behind every word there must be a proof.i have put evidence behind my statements, written and in photos.and where is yours? P.S. you dont have to tell me to enjoy a ban from here.i already do, since last night, when i was banned. Dear Omurtag. You know very well what you're doing. You've been in constant contact with staff about harassing other players. You've received several warnings which have later been upgraded to mutes cuz your repeatedly breaking of rules. We do not tolerate harassing players, we told you to ignore players countless of times. Repeatedly harassing players and initiating arguments/dramas on world chat and straight out targeting certain players for personal harassment. The pictures are just a handful of your offenses. You didn't stop and your punishment was moved to 1 month ban, starting yesterday. However since your dedication to trying to paint one of our Staff members as a nazi, the same staff member who have helped you with 73% of your tickets, your ban have been upgraded to permanent. I won't bother defending myself in response to your accusations of me supposedly being a "Nazi", seeing as my supervisor and my colleague have already spoken. However, I shall leave these little gems here, seeing as you demanded evidence while failing to provide any of your own. Your removal from the server and its services was a foregone conclusion once you managed to piss off 6 different Game Masters with your constant drama, delinquent behavior and regular incidents of you repeatedly provoking others into fights / arguments whilst bypassing the ignore list. It gave me absolutely no pleasure to have to do this, but you left us with no alternative. Each time that we lose a player to quitting or permanent-bans, it hurts us all as a community. This topic will serve as an example and a reminder of what happens when one repeatedly violates the rules. Mute DIVIDE Console 30 May 2016 11:18 30 May 2016 11:28 Insulting and harassing players. Mute DIVIDE Axistiger 01 Jan 2019 22:22 08 Jan 2019 22:22 Multiple complaints of targeted & personal harassment against other players. Mute DIVIDE Andriuss 23 Jan 2019 16:39 23 Jan 2019 17:39 Harassment. I let you keep playing despite this, hoping that you were just ranting out of anger and not thinking clearly. You were on thin ice by this point. (3:08:28 AM) TW: <WoW>[Voyonkor(80)[PA]] then lets que warsong? [5. world] : <IRC>[Axistiger]: Keep that political crap off world channel, thanks. [5. world] : <IRC>[Axistiger]: Omurtag I won't repeat myself. Don't even try me. [5. world] [Kimberley]: you create rules ad hoc? [5. world] : <IRC>[Axistiger]: Ad hoc nothing. Check the rules. Section 2 rule 9 is quite clear about it. [5. world] [Kimberley]: is politics "content of inappropriate nature"? [5. world] : <IRC>[Axistiger]: Tell me where discussion of "zionist-america" and reduction of population (2 different idealogies of semi political nature) are appropriate on a public chit-chat channel. I'll give you a hint, they're not. 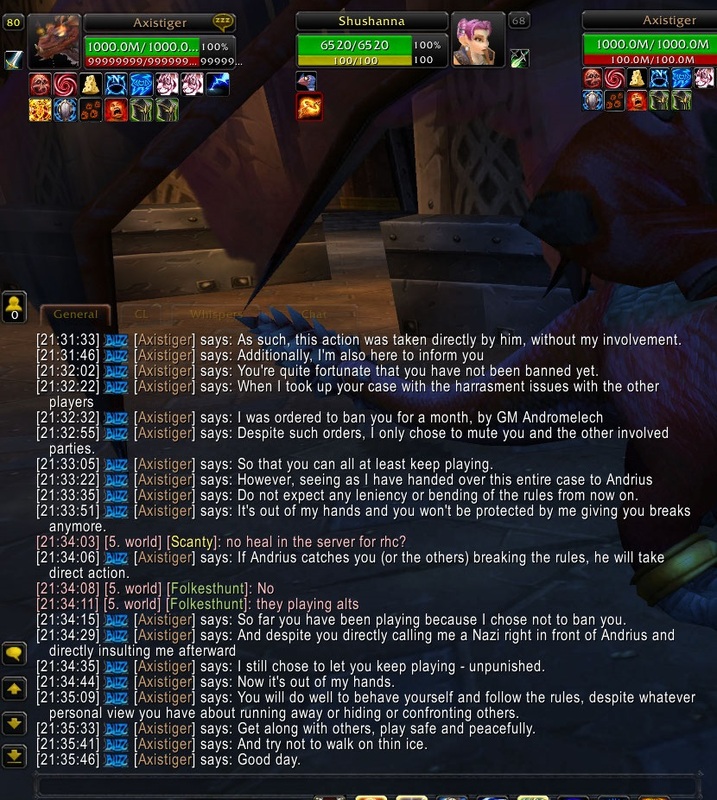 [5. world] : <IRC>[Axistiger]: People only asked for RBG and he saw it fit to bring it up for no reason. [5. world] : <IRC>[Axistiger]: Kacey, you're the last person to be discussing how the rules can and cannot be enforced. [5. world] : <IRC>[Axistiger]: Now drop it. [5. world] [Kacey]: interesting.. could u explain it more? [5. world] [Kacey]: why someone is more or less allowed to say something about rules? [5. world] : <IRC>[Axistiger]: No, you're not owned any personal tutoring of the rules. Go and and read them them. If you don't understand them, read them again. And again, until you do. [5. world] [Shushanna]: one thing really strickes me, how can a person, not to mention its GM as well, is allowed to operate under such a name? [5. world] [Justicepower]: whats that Shushana? 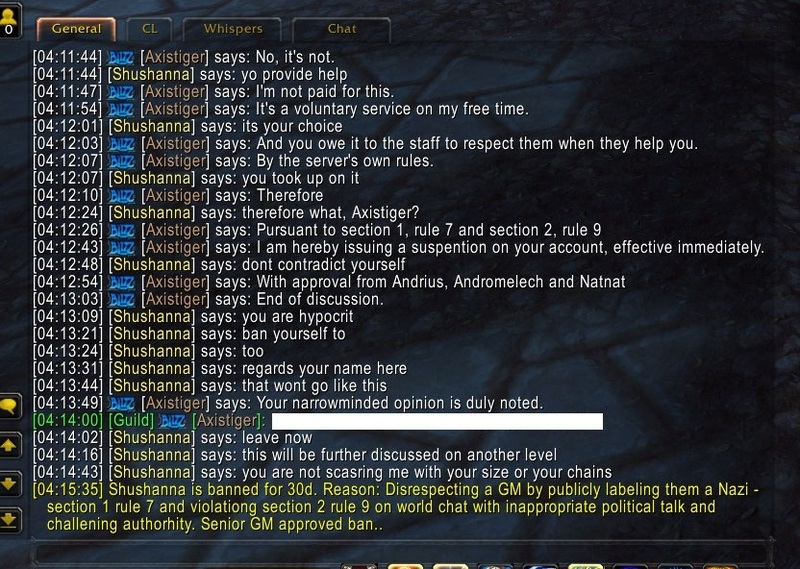 <TW> Axistiger has banned Shushanna permanently, reason: By order of Andromelech. <TW> Axistiger has banned Omurtag permanently, reason: By order of Andromelech. You had a chance to end the drama, multiple times. You could've chosen to stop, at any time. You could've taken your month's break to cool off and think about the choices you've made thus far. You could've just quietly returned after that to resume playing peacefully, after having learned your lesson. You decided not to. You chose to push your luck, despite multiple opportunities to just walk away. And now, it's time for you to leave. Remember, your choices led to this. If you break the rules, you suffer the consequences.